The Mad Men series may be all but a memory, but many of the fictional Don Draper’s haunts live on. You can raise your glass at one of his pricey favorites like Keens Steakhouse, Grand Central Oyster Bar, Barbetta or The Palm… or choose his more budget-friendly P.J. Clarke’s, Vander Bar or Dublin House. If the latter is more your style (as it is mine), the following list of nearby eateries and watering holes is just what this production manager (and the client) ordered. So grab a cab and enjoy a bite, a beverage—or both—at these reasonably priced options when you are in town. Don’s Upper West Side “Old Irish Pub”: Dublin House—225 W. 79th Street, between Amsterdam Avenue & Broadway. 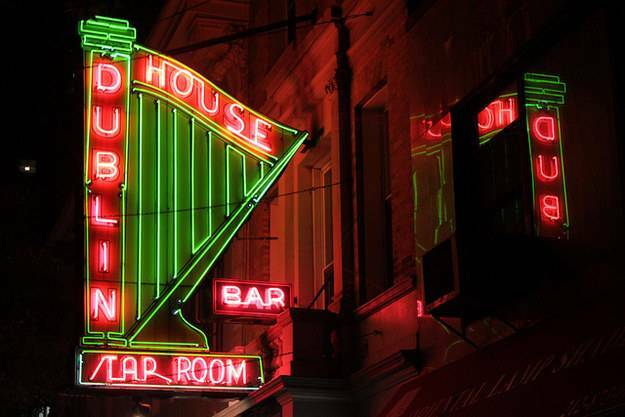 The Dublin House is a real New York City Irish neighborhood bar. Established before Prohibition, it is literally and figuratively a historic landmark. Don’s Hell’s Kitchen “Italian”: Barbetta, 321 W. 46th Street between 8th & 9th Avenues. Within this beautiful brownstone, the oldest family-owned Italian restaurant in New York offers a traditional Italian menu and one-of-a-kind New York experience. Don’s “Steaks & Seafood” for Grand Central Riders: The Palm Restaurant (The Original)—837 2nd Avenue at 45th Street. The Palm philosophy is simple: Treat guests like family, serve great food and always exceed expectations. The restaurant became a place to not only enjoy an excellent meal but also catch up with friends and close business deals. Don’s Nightcap a Little Further North: P.J. Clarke’s (The Original), 915 3rd Avenue at 55th Street. Step inside and you’ll know instantly why P.J. Clarke’s became a legendary haunt of the famous, infamous and unknown alike. Have some advertising fun following in Don’s footprints. Can you think of any other bars or restaurants mentioned or visited on the show? Feel free to share your finds or comments on these places. Cheers!